Dental implants are always at least a little loose when they are placed, because the bone hasn’t integrated around the root form yet. Loose dental implants that have been in the mouth long enough to have healed have failed, and there are several possible reasons for that failure. 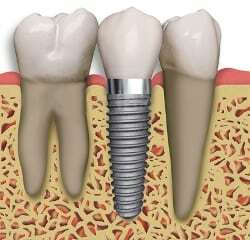 The diagram at the left shows a complete, healed dental implant. The bone has healed tightly to the root form fixture. This bone healing process around an artificial root form is called osseointegration. When osseointegration fails, the dental implant is loose and it can’t be used to support teeth or a denture. They may be placed under load prematurely. Osseointegration is a process that takes a certain amount of time. Impatience with this process can tempt a patient to want the dentist to place the teeth before the bone is ready to support it. You know that if you break a bone, the bone pieces have to be held immobilized during the healing process. It’s the same with dental implants. Premature loading will cause there to be movement and will prevent proper osseointegration. Some dentists, in an attempt to save money, will place substandard fixtures. There are only five companies that manufacture dental implant fixtures that are approved by the FDA and the American Dental Association. There are stringent manufacturing standards that have to be corroborated by clinical tests before a company can get this FDA and ADA approval. While generic root forms can save a dentist hundreds of dollars, they have a high rate of failure. The root forms can also become infected after they have been in service. This infection is called peri-implantitis. It is similar to periodontitis, a disease that destroys the bone support of natural teeth. Teeth that are extracted are often infected, and if implants are placed without the infection being fully addressed first, the infection will often carry over and prevent the fixtures from ever tightening. Also, if there is inadequate bony support, they will become loose. After teeth are extracted, your body resorbs the bone that used to support the teeth. If enough bone is missing, Dr. Thein will recommend bone grafting. In an effort to get patients to proceed to treatment, dentists may feel tempted to cut corners here so that they can quote a lower fee. But when the case fails several years down the road, patients may find that they were lured into a false economy. Or, they can be improperly placed. Failure to use three-dimensional CAT scans as part of the diagnostic and planning process can lead a dentist to place them in areas of inadequate bony support, into a sinus cavity, into a concavity of the mandible, or other places where there isn’t enough bone. Unfortunately, the solution has to be starting over. Sometimes a larger fixture can be placed into the site and allowed to heal properly. Often, however, there needs to be a healing time between removal of the old and insertion of the new. Infection issues may need to be addressed before this can be accomplished. Bone grafting may be required, and this will have to be allowed to heal before proceeding further. Dental implantology, unfortunately, is a relatively unregulated area of dentistry. Since it isn’t a legally recognized specialty, there are no set training requirements. Dr. Robert Thein, even though it isn’t legally required, has pursued extensive post-graduate training in implantology, and has achieved significant credentials in this area. Read more about Dr. Thein, his training and credentials.